The contest is over. The entries have been collected. 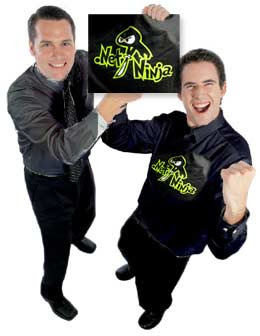 The true .NET Ninjas have shared their stories with us. And while the stories have no actual bearing on the winners, we did get some pretty incredible tales. Everything from someone who actually survived a caffeine-free development day to a true ninja master that never programs with caffeine. Truly inspiring. To further establish his place a .NET Ninja master, commenter Nick (our caffeine-free developer) also relayed an incredible story that puts him in the running for .NET Ninja of the Year or the Darwin Awards- I haven't decided which yet. In short, while going about his normal, stealthy, .NET Ninja developer duties, assassins from KAOS sabotaged transformers near his building causing them to explode in a massive fireball. But rather than run for safety and rely on his trusty off-site back-ups...eh hem...Nick rushed in to the building right next to the burning fireball to try to save his database servers. Unfortunately, the flames licking at the building were too much even for a great .NET Ninja and the DB servers were lost, but the story is still impressive. But since the .NET Ninja stories were all good, I have decided that there will be no losers in the giveaway. Everyone that commented by the deadline that meets the contest guidelines (primarily, that you're in the US), will get their very own .NET Ninja t-shirt! Who's the .NET Ninja master now? Winners- email me at todd [dot] anglin [at] telerik [dot com] and I'll send you your prizes.